Are you experiencing broken things? We feel you. We know your pain. This also means we buy allergy medicine. Having a lot of open windows is actually kind of fun; it's not too hot here in Colorado and you can hear the kids playing outside. You can also hear your neighbors discussing trimming their hedges; yelling at their dogs; and jumping on trampolines. This part is a little weird. As a southerner, not having air conditioning seems like not having a lung. Or a dinner table. It just feels like a major THING is missing. But once we realized that saving up for the replacement compressor unit was really the only option, well, I just kind of accepted it. And cranked open sixteen windows. > Garage Door. The torsion springs were apparently put in by the neighborhood builder using the cheapest product available. So, along with all of our neighbors, our garage door broke down like an old donkey. > Dryer. When we moved into this house almost seven years ago, we purchased a very pretty middle-of-the-line Whirlpool washer/dryer combo. At some point, the heating coils overheated, tripping every fail safe inside the dryer. Melting ensued. Jonathan YouTubed the heck out of that thing and then ordered $125 worth of parts online. After watching videos over and over, he was able to get the dryer back on its feet. > Dishwasher. Again, another nice Whirlpool appliance. Something plugged and whatever...I stopped listening. A few dollars online, another YouTube video and Jonathan had the dishwasher up and running again. I know these are all first-world problems. I know I am blessed to have a newish house filled with modern conveniences. I know all of this. And hopefully, things are about to stop breaking down around here. But when you are facing hundreds or thousands of dollars of repairs you weren't expecting, it can get a little panicky. So, if this is you, take heart. We're going through a Season of Broken Things. It's not fun and it's not cheap. I hope that your brokeness passes quickly. And I hope our story encourages someone, somewhere. Also this: if you stop by for a visit, dress in layers. Jonathan is gearing up for edits on A Pig, A Fox and A Box, his fourth easy reader that will be published by Penguin USA next summer. Part of this work involves mocking up a cover. We can't say if this will be the final piece of cover art or not, but it's one idea. I am digging the colors, especially the light blue, a favorite of mine. 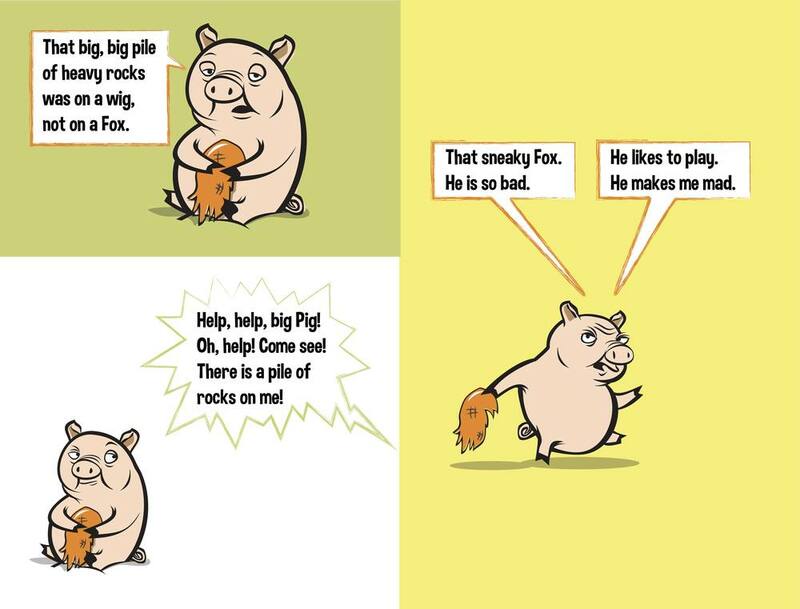 A Pig, A Fox and A Box is a completely fun romp between two friends, the snarky Fox and the gentle Pig. We think if you like Woodward and McTwee, Jonathan's most recent young reader (and one that features a devious bird and sweet rhino,) you'll love the new book. Come on, Summer '15! To celebrate summer, reading and pranking good friends, we are giving away a hardcover copy of Woodward and McTwee. To be entered to win, just share this post on Facebook or Twitter. Then, come back here and tell us you shared it by posting a quick comment below. We'll draw one winner on Monday, June 15, 2014.We can ship to USA addresses only, please. Thanks for reading and make sure to share this post! Good luck! Jonathan is headed out this morning to a local school, Eastlake Montessori. He'll read Love Is in the Air, Guppy Up! and Woodward and McTwee. A lot of the kids purchased books ahead of time, so they'll take home autographed copies. Fun! If you have kids in your home, you read a lot of children's books. Books are everywhere around here. And beware the tidy mother who attempts to curate the collection. There were howls of protest when I started to "thin" out the bookshelves earlier this week. But we had to...shelves were stuffed and books were piled and the baby would drag them around, chewing and mewing for someone to read to her. (Kidding! She's in that stage where a book is simply not that interesting. We still read to her, of course, but she wanders off to see how her older sisters are clobbering each other. True story.) In any event, we filled a box-o-books to take to Goodwill. "When we had our first daughter seven years ago, I delighted in buying old picture books at thrift stores and discovering new titles at our local bookstore. When I wrote Love Is in the Air (indeed, whenever I write) all of my favorite books were (and are) swirling in my head, a beautiful, highly respected and influential mass of collective imagination." In book news, we're pleased as punch to tell you that Penguin USA made an offer for Woodward and McTwee. It's one of several stories about a sweet, innocent hippo and a super snarky bird. The book will be published in 2014. We love Penguin, including Jonathan's editor, Bonnie Bader. Go book people! That's it from here! We invite you to head over to the new home of Fat and Appy, and our new collection of canvas prints for children featuring Jonathan's designs. Save 15% by signing up for our newsletter. Thank you for visiting. We adore you so much. Tell us in the comments: what is your favorite children's book?